Skill. Passion. Intelligence. These are just a few of the traits instilled in the athletes at Next Level Training, the Midwest's premier soccer trainers. No other training facility offers our combination of high level experience and intense desire to help our trainees succeed. Class Schedules We offer classes at a variety of locations. Classes fill up quickly so sign up now! Sign Up For Training Click here to sign up for the training sessions of your choice. We will be offering early drop off and late pick up this year. Early drop off will begin at 8:00 and late pick up will end at 4:00. 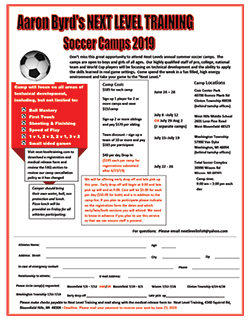 Cost will be $5.00 for each per day ($10.00 for both) and is in addition to the camp fee. If you plan to participate please indicate on the registration form the dates and which early/late/both sessions you will attend. We need to know in advance if you plan to use this service so that we can ensure staff is present. Looking for something fun to do over the break? 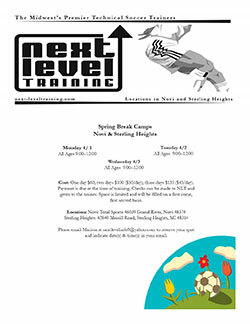 Join NLT for a three day mini camp! Dates, times, pricing information, and location addresses are below. Space is limited so please let us know if you’d like to participate. Please email nextlevelinfo9@yahoo.com to reserve your spot. Make sure to indicate date(s) and time(s) in your email. Thanks, and enjoy your break! Payment is due at the time of training. 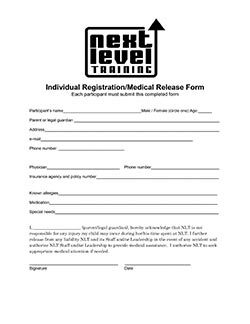 Checks can be made to NLT and given to the trainer. Please email nextlevelinfo9@yahoo.com to reserve your spot. Make sure to indicate date(s) and time(s) in your email. Space is limited and will be filled on a first come, first served basis. We have trained over 500 college players and college commits at some of the largest soccer schools in the country, including powerhouse programs like North Carolina, Michigan, Michigan State, Notre Dame, University of Virginia, Connecticut, and more. Numerous NLT trainees have been invited to participate in both men's and women's national team events. Every year we train over 2000 athletes while maintaining the small session size that help facilitate progression and development.